Lots of head and thick lacing. It's not clear in a glass but it doesn't say unfiltered. It's 6.5 % and pleasantly flavorful and not "thick" or "oily." 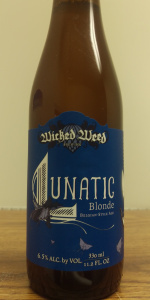 It's definitely a worthwhile blonde style although I'd suggest a sweeter after-taste. Pours a clear deep medium-deep gold with abundant effervescence streaming up from the goblet srem. The pour produces almost 3 fingers of soap bubble foamy, glowing white, moderately lasting head that recedes to a thick island cap and bunchie collar ring but leaves behind minor lacing. Aroma is light but clean bready pale and cracker malt with notes of fruity melon, banana, orange, white fruit and cloves. This taste like a fruity Bohemian pilsner fermented with Belgian ale yeast. How novel. Flavors of bread, cracker/biscuit malt, orange, lemon, grass, banana, cloves and white fruit hints in a dry finish are all present producing a hop bitter dry aftertaste that is out of character with the style but I think that's what they were after. Not as balanced as their video suggests, still it is quite nice. Not World-Class but certainly very good. Mouthfeel is medium bodied, moderate-high carbonation, smooth, creamy, tongue embracing and slightly juicy. With a opaque dark straw color, it’s…bitter! Despite the yeasty malts and dried fruits, it’s very piney throughout the tasting, including the aftertaste with yeast bread overtones. It’s not very enjoyable overall! 12-oz. can into a big tulip. Hazy gold with a lot of suspended yeast and a thick white head that leaves a sizeable cap for some time. Very traditional Belgian on the nose: banana, clove, spice. They claim they've tried to leave the hops forward on the nose, but I don't detect much. However, there is definitely some hoppiness in the flavor. You still get the ester sweetness, but there is much more balancing bitterness than there typically is in the style. Mouthfeel is a little thin and slick. poured from a 12 oz canwith a three finger head lasting a while. A strong fruity aroma i thought this would be aweful or awesome. the aroma was grape, fig and plum, the taste decisively exceeded the aroma with fruit yeast coriander a surprising floral and grassy hop presence and a slight taste of pepper. I think anybody who has drank at least two craft ales could have easily spoted at least four if not five different flavor components. this was my first wicked weed beer and i hope to find more in central Tennessee great beer.